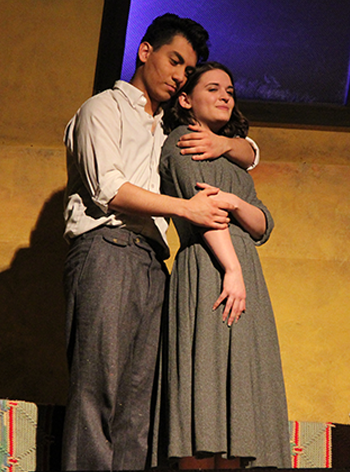 Humanities Department instructor Deb Layton had an opportunity to play the role of Anne in the production of The Diary of Anne Frank when she was a student in college. 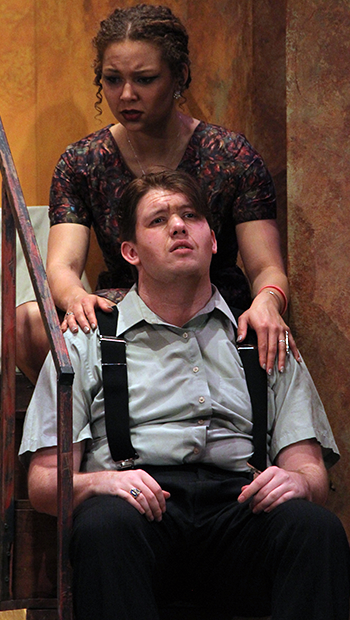 Layton experienced youth and exuberance all over again while serving as the director for Cowley College’s production of the Diary of Anne Frank March 3-5 in the Robert Brown Theatre. The production was based on the book Anne Frank: Diary of a Young Girl. “Returning to it again now after so many years has given me new perspective,” Layton said. The Diary of Anne Frank is a book of the writings from the diary kept by Anne Frank while she was in hiding for two years with her family during the Nazi occupation of the Netherlands. The family was apprehended in 1944, and Anne Frank died of typhus in the Bergen-Belsen concentration camp. The diary was retrieved by Miep Gies, who gave it to Anne's father, Otto Frank, the family's only known survivor. Layton said the students began rehearsing at the start of the spring semester and is proud of what they were able to accomplish. “We put a lot of time in building relationships of the characters and working on the look and sound of the production,” Layton said. According to Layton, The Diary of Anne Frank does a wonderful job conveying the vivacity of a young girl and showing her mature, all the while maintaining her sense of wonder and hope. She asked those attending the performances to take a little of Anne Frank’s attitude with them as they go. “In spite of everything, I still believe that people are really good at heart,” Layton said.